Summer, a.k.a. swimsuit season, is quickly approaching. Ready to get fit? 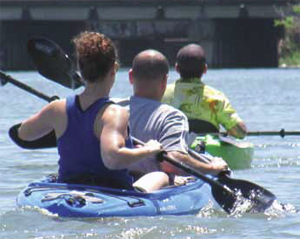 New Orleans is full of outdoor activities, like sailing lessons and kayaking tours, a. And this lovely spring weather is a great time to enjoy them. So gear up, grab a friend, and get moving! Spring is the perfect season for coasting the cool waters of Lake Pontchartrain while socializing with your mates. So hop on board and set sail! Not sure how to start? Enrolling in an adult sailing class is the first step. Murray Yacht Sales offers both private and group sailing lessons for beginners. From trimming the spinnaker, to learning the correct sailing terminology, students will discover the basics of this enjoyable pastime. Expert instructors provide the confidence and knowledge that’s necessary to turn any landlubber into a capable sailor. Besides learning how to sail, students will experience camaraderie with fellow classmates and have a chance to participate in the many social events associated with the sport. Visit Murray’s website at www.murrayyachtsales.com for additional details. Between working out and running errands, even Saturdays can become a bit hectic. But thanks to Priorities, active wear that goes anywhere, you have one less thing to worry about while crossing items off of your “to do” list: a wardrobe. This Magazine Street shop offers a unique line of active wear that creates an effortlessly polished look for ladies on the go. The featured comfortable ‘skort’ and polo ensemble by Golftini is perfect for golf, tennis, Zumba class and can even work as ‘carpool clothing’. Now that’s a hole in one. If you plan on participating in the aforementioned kayaking and sailing activities, then you’d better make sure that you have the right waterproof gear. Massey’s Outfitters on N. Carrollton offers everything you need, including the Sea to Summit Ultra-Sil® Dry Sack. From your cell phone to your favorite shade of lipstick, your belongings will be protected from the elements by these ultra light weight and seriously durable bags. And, Massey’s offers an array of eye-popping colors of the Sea to Summit line, so there’s no need to forgo your style for security. Check www.masseysoutfitters.com for additional product details.